Shopping for a new Toyota Sequoia? The Toyota Sequoia shows its age in every trim, but the base SR5 is a decent value with its standard active safety tech and the brand’s sterling resale values. The beat goes on for 2019 with no significant changes to the four trim line-up. The base SR5 trim has one up its sleeve compared to its rivals: active safety tech such as automatic emergency braking is standard. The range-topping Platinum trim adds niceties such as perforated leather seats and adaptive suspension. The TRD Sport and Limited trims fill the gaps in between. Unlike the Cadillac Escalade and Lincoln Navigator that are based on Chevy and Ford models, there is no bucks-up Sequoia. The choice between drivetrains is a simple one: a big and powerful 5.7-liter V-8 is standard with the option of rear-wheel or a part-time four-wheel drive system. What the engine gives in power, it takes away in fuel efficiency. 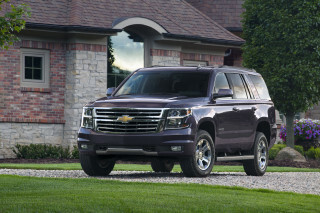 Rated at only 15 mpg combined, it is well behind its main competitors, the Chevrolet Tahoe and new Ford Expedition. The Sequoia’s ride is soft, made better in Platinum trim with the adaptive suspension. Handling is ponderous at best, but the Sequoia is comfortable on the highway. Properly equipped, the Sequoia can tow up to 7,400 pounds. Its interior is composed of low-sheen surfaces that don’t look or feel as luxurious as this SUV’s price tag suggests. Its space is versatile and its seats are comfortable, but there’s no getting around its cheap feel. The Sequoia is also behind the game when it comes to tech. Its standard touchscreen for infotainment lacks Apple and Android smartphone compatibility. Don’t bypass the Sequoia entirely if you’re shopping for a full-size, three-row SUV—but its rivals are more popular and for good reason. 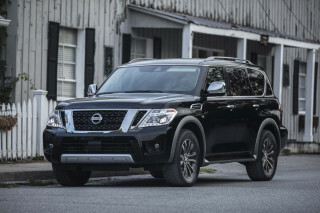 Updates a few years ago don’t keep the Toyota Sequoia from looking like anything but yesterday’s duds. The 2019 Toyota Sequoia casts a familiar shadow. It should, since its last redesign debuted a year before Barack Obama announced his candidacy for president. The exterior of the Sequoia retains the softly curved and bulky shape that was en vogue back in 2007 when it first hit the market. The front and rear fascia updates modernize the look with sharp angles and segmented chrome pieces, though the body sides and tailgate retain their heavy appearance. The Sequoia’s truck-based design administers natural proportions with a short front overhang and an A-pillar that begins far behind the front axle. Once inside, the driver is met with vast amounts of hard plastic trim. The near vertical shape of the dashboard further suggests its truck roots and maybe even a middle bench seat option (there isn’t). Dressier Sequoia trims such as the range-topping Platinum pepper in hints of fake wood trim, but the effect is more dressed-up truck than modern luxury SUV. The Toyota Sequoia’s V-8 provides good power, but this SUV’s trucky roots show through. The 2019 Toyota Sequoia is a brash, big bruiser of an SUV. Its V-8 is muscular enough to merit a point above average for its towing ability, but we take that back for handling that’s truck-like at best. 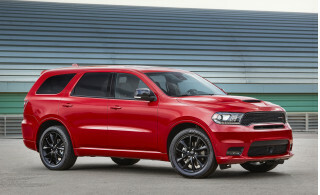 The Sequoia’s V-8 is rated at 381 horsepower and 401 pound-feet of torque and it roots power to the wheels via a 6-speed automatic transmission. Its power ratings are good, but the Sequoia’s 6-speed gearbox is down four cogs compared to its more advanced rivals. That helps explain its atrocious 15 mpg combined rating. At least the V-8 makes all the right noises and moves this big SUV with authority. That said, power isn’t all that makes a sporty vehicle good. The Sequoia TRD that was introduced last year is a head-scratcher, to say the least. Its steering is just as slow as the rest of the lineup’s and its high center of gravity isn’t totally negated by the Bilstein shocks and beefier anti-roll bars. We don’t understand it. Each Sequoia trim level comes standard with rear-wheel drive but can be equipped with a part-time four-wheel drive system with a low-range transfer case and a locking center differential. Frustratingly, the system is only intended for off-road use where the tires are allowed to slip to prevent drivetrain binding. An electronic traction control system limits rear-wheel spin once detected, but it’s no match for the ease of automatic four-wheel drive seen on every rival. Properly equipped, the 2019 Sequoia can tow up to 7,400 pounds. The Toyota Sequoia is plenty practical, but its interior would feel tacky at half its price. The 2019 Toyota Sequoia has plenty of space inside and comfortable seats, but we can’t get over the dated, cheap feel of its interior furnishings. It doesn’t feel like a 2019 vehicle—it feels like one from 1999 inside. Up front, the Sequoia’s seats are broad and well-padded, with standard 8-way power adjustment for the driver’s seat. Cloth upholstery is standard on the Sequoia SR5, although models with leather are more common on dealer lots. Competitors have also surpassed the Toyota for ease of third-row access. If getting back there will be a frequent task, the Highlander crossover SUV may be a better option. A power-folding function to the third row is optional on the Sequoia and a more comfortable, two-passenger captains chair layout for the second row is available in the Platinum trim. The Sequoia’s truck-like body-on-frame chassis design cuts into interior space compared to Toyota’s own Sienna van. The space occupied by the frame prevents modern crossover conveniences such as a low loading floor and tumble-into-the-floor seats. Those are acceptable tradeoffs for many buyers interested in a vehicle with a high towing rating for the added capability though this rating reflects the the uncomfortable seating and the fit and finish gaps that no longer within the normal limits for the segment. The large climate control dials and plain hard plastics have a rugged and durable feel, though more elegant approaches are used by the competition. The 2019 Toyota Sequoia has not been crash-tested, but it does include active safety gear as standard. In a vehicle this size, a backup camera, blind spot monitors with rear cross-traffic alerts, and automatic emergency braking should be standard—and they are. Toyota also includes lane-departure warnings, forward-collision warnings, and automatic high-beam headlights. Front occupants are protect by front airbags, seat-mounted side airbags, and knee airbags while all rows feature side curtain airbags. The chassis is also equipped with modern features such as brake assist, brake force distribution, vehicle stability assist, and a tow/haul mode which helps lessen the force burden on the brakes. Toyota offers a feature packed base model though the highest tier Platinum trim doesn’t offer some of the high-tech equipment of its competitors. The 2019 Toyota Sequoia is available in four trim levels that start at around $50,000 and climb dramatically from there. We rate the lineup at 5 out of 10 with a point for standard safety gear that we take back for the lack of smartphone compatibility. 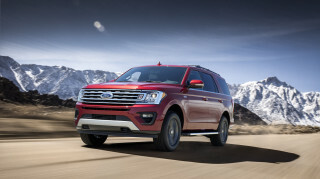 The Sequoia features an impressive list of equipment as standard including 18-inch alloy wheels, LED high and low beam and daytime running lights, body-colored heated mirrors, and a sunroof. Inside the thick leather-wrapped steering wheel, power adjustable cloth seats, and a 4.2-inch display in the instrument cluster are augmented by a three-zone climate control system. A 6.1-inch touchscreen for infotainment includes satellite radio but lacks Android Auto and Apple CarPlay compatibility. 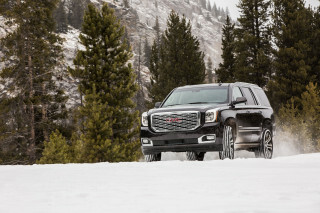 At about $53,000 with four-wheel drive, it’s expensive but the best value of the lineup. The Limited brings bright 20-inch wheels, chrome mirror caps and door handles, and a power tailgate. Leather seats with added adjustability for the driver, a power-folding third row, and navigation balloon its price to about $61,500 with four-wheel drive. The Sequoia Platinum trim level receives adaptive dampers, a load-leveling suspension, unique 20-inch wheels, power folding mirrors with turn signal indicators, and additional chrome exterior trim. Cooled front seats and a Blu-ray system for rear-seat riders help justify a price just shy of $70,000. The thirsty 2019 Toyota Sequoia cancels out the brand’s thrifty Prius hybrid. The Toyota Sequoia delivers throwback fuel economy. Its 13 mpg city, 17 highway, 14 combined rating with four-wheel drive is among the lowest of any new car. Sticking with rear-wheel drive does little other than to boost the combined figured to 15 mpg. For comparison, the larger and more powerful competition is rated at 17 and 18 mpg combined. While there are reasons to consider a Toyota Sequoia, fuel economy isn’t one of them. 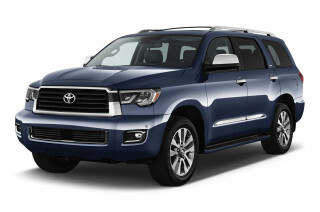 Looking for a different year of the Toyota Sequoia?